Enjoy outdoor living with the ambiance of our our 100% recycled granite fire pit. The popularity of fire pits is one of the latest trends in outdoor living and design. The allure of sitting around a fire has been around since the beginning of mankind. Fire provides light and warmth, while encouraging you to unwind. With our compact D.I.Y. system, simply clear a 4′ x 4′ area and assemble. It’s as easy as 1-2-3. Within minutes you’ll be enjoying your very own outdoor fire pit. Proper design and construction will ensure a safe and enjoyable feature that will last. Our fire pits are engineered for a very simple installation, will provide many years of entertainment, and are perfect for your back yard or patio. The dry stack method makes assembly easy. For ground surface applications, simply clear a 4′ x 4′ area. Level with play sand, if necessary. Place 12″ x 12″ pavers on the center of cleared area to complete the fire pit base. Next, place the fire pit steel insert on center and begin stacking the lazy curve wall stone around the insert, staggering each layer. Finish by placing the dark cap stone pavers on top of the wall stone to the finished height of 15″. You are ready to light your fire and relax. Click on the video link below to see how easy it is to set up your own Granite Fire Pit! Fire pit kit – great idea…very cool! We would like to purchase your D.I.Y. 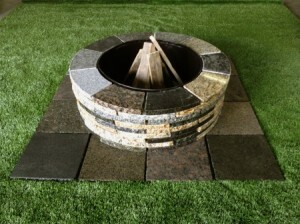 granite fire pit kit as shown above for $479.00. Can you pls help us with this purchase? Thank you. Check for an email from our office. I am interested in the DIY fire pit. Do you deliver to North Carolina? My zip code is 27608. What would the total price be for the product and shipping? We are so glad you are interested in the fire pit. Look for an email from us with more information. 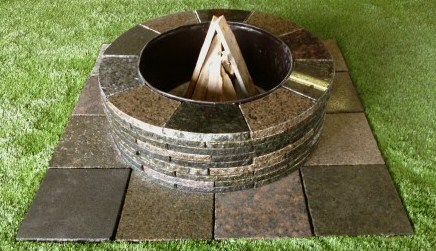 Interested in purchasing the DIY granite fire pit kit discussed here. Thanks. Thanks for your interest! Please give our office a call at 585-586-6510. I am interested in receiving a quote for your granite fire pit. Thanks for your interest, Lisa. Please send along your contact information to mcmstoneinc@yahoo.com. Can you send me more info in the fire pit? Certainly, look for an email from larissa@mcmstone.com. Thank you for your interest! We bought the fire pit with the plan to install it within our new patio. The base is a little over 49″ squared…had the contractor leave a 50″ square opening in the patio. It came out great. We are pleased that you love it!